The quality of the fabric is great. The only reason I gave them four stars is because the color could have been a bit more prominent. But other than that they do look well in the Bedroom. High Fashion design meets chic sophistication with the Vue Signature Arashi Window Drapery Panel. 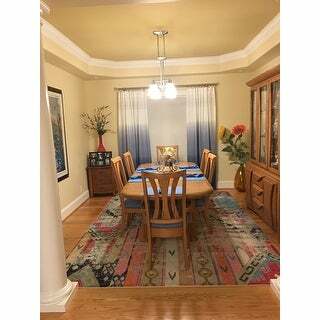 This fashionable panel offers a decorator style and features a burst of color at the panel base that ombres upward. Color coordinated embroidery creates a geometric top border. Rod pocket measures 3 inches and is recommended with a 1.5 rod for maximum movement. Use rod pocket hanging option or hang from clip rings for added style. Clip rings not included. Machine washable, tumble dry on low heat. 100% Cotton panel. 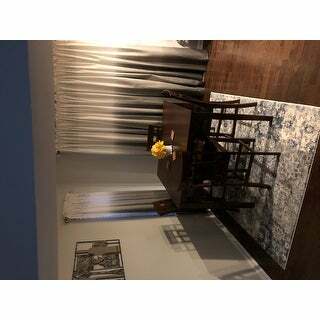 My husband FINALLY agreed on curtains! 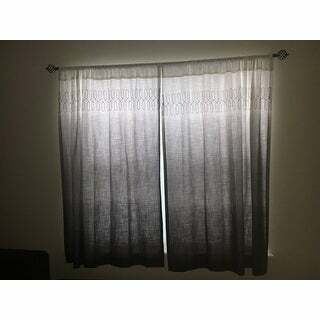 My husband hates curtains and was not happy about this purchase until they were up. He admitted that these added so much to the room. Love the colors and the design on top! Love these drapes,they are a good weight, wide rod pocket allows for wider rod to be used. You won't be disappointed. I hung mine with clips. I would suggest getting a thicker rod if hung from the lower rod pocket. I couldn't get mine to hang right but the clips helped. I got the look I wanted. I'm thinking of ordering again to give a fuller look to my windows. Very pretty drapes, a bit stiff upon arrival so I will wash and lightly iron, but they seem very nice. If you are using the rod pocket, make sure to hang one side of your brackets about 1/8 inch higher to accommodate the skinnier side of the rod, if not, it throws off the embroidery on top, doesn't look even. Easy to fix though...minor adjustment and the problem is solved. I ordered the Indigo panels and they are really beautiful, I love the colors. They are a good weight and drape nicely. You do need to buy rings to hang them from and the panels are sold separately so you need to purchase 2 if you want a pair. I bought 6 of these panels in melon and absolutely love them! Have a triple window to cover, so sewed three together for each side. Really are a statement piece and make the room; however one of the panels, when sewed together exactly end to end to the other was almost 2 inches different that the others. It drug on the floor while the others were 2 inches off the floor. After trying to figure out why, we came to the conclusion that the one panel was out of square. Returning it would involve ripping the stitches out and so we are trying to adjust it at an angle on the top of that panel. They are made out of a gauzy material and some describe them as "sheer". I would not say they were sheer, but do let some light in. 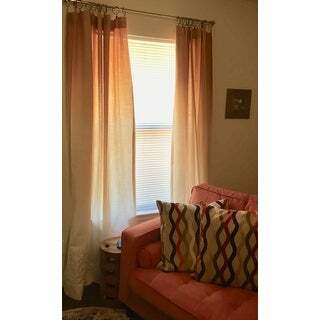 Nice curtains, not as dramatic a transition between colors as in the picture but still a nice gradiant. Look not so great if you place directly on the curtain rod. I highly recommend curtain rings with clips, look so much better with these. 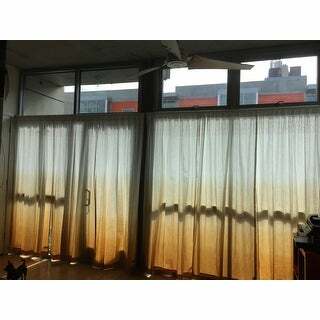 Arashi Ombre Embroidery Curtain Panel are very elegant. They are the perfect color & size. I love them. I purchased the gold version and it is so beautiful in person. The colors are rich and the ombre has a smooth transition. 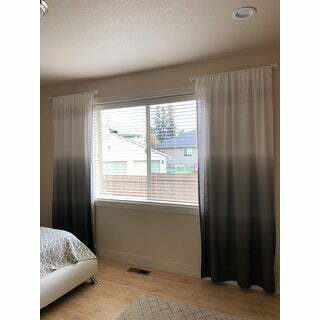 Only recommendation is that the top is a little tight if you're using a thicker curtain rod, but we used the curtain rod hooks, so it's not an issue. They look fantastic and brighten up our living room without breaking the bank! Purchased in gold to cover a wall of windows in my urban apartment. Love that they give privacy but still let in light. I ordered these in the gold. I was a bit concerned they may show up and be more yellow than gold but they aren't! They are a lovely shade of gold and the ombre affect is gorgeous! I flipped them and hung them upside down with gold clips to give them a more modern flare. They look fantastic! I really liked these. The faux linen material was substantial and hung nice. 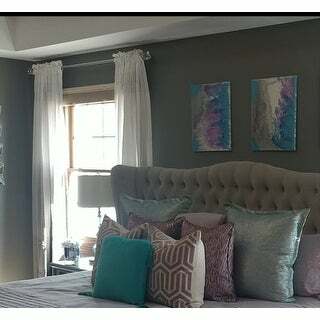 However, the mid grey tones have a lot of taupe in them which made them look 'muddy' at night next to my grey & white walls (my grey is a cool grey with blue undertones). So I have to return them. I bet they're pretty in the blue or gold. I love these curtains. They look awesome in my dining room as you can see. They were a little pain to iron and get the wrinles out but they hand nicely. 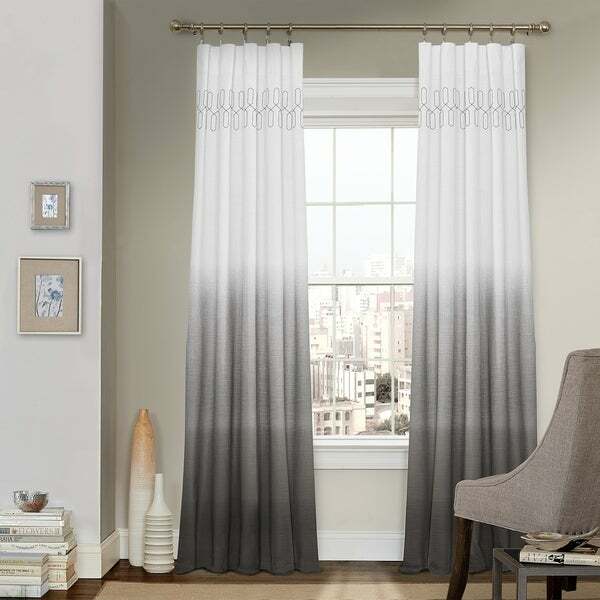 These drapes are perfect!! Love the combre effect and the fabric is high quality. Great price too. I was looking for curtains for my living room in our new home. I bought three in the color blue and put a curtain rod through the opening at the top instead of using clips because I wanted more of a finished look. They are great quality and the color is true to what you see online. I am super happy with them and they add enough interest to the room without being overwhelming. Great purchase! The material is elegant and the colors blend beautifully with my living room accents. I love them !! Very high quality. Great product. Very pleased with this purchase. Love the color hues. Very nice looking. Great material and the pattern is just like the pic. The weight of the curtain is perfect. 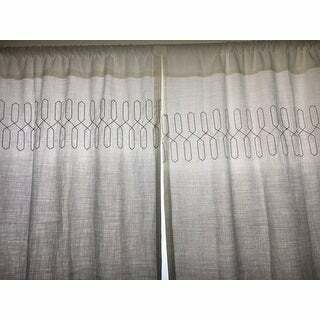 I recommend these curtains. Well made but were returned. The colors didn't work well in my room. Getting ready for spring, out with the old. And in with the new they are nice and bright and I love the way they stand out on the windows. "With a window 104" wide do you recommend ordering 4 panes or do you think 2 would look okay. lori p."
Mine is 120" and definitely took 4. In my opinion two would be enough. I hope it helps. "Are there 2 panels or just 1 in the package? There are 2 different responses." I ordered the Indigo in October 2018 and ordered 2 panels, only one came in a package. No the curtains are not lined. Even though they are not lined, they do block out a significant amount of light. No, but it is not noticeably so. 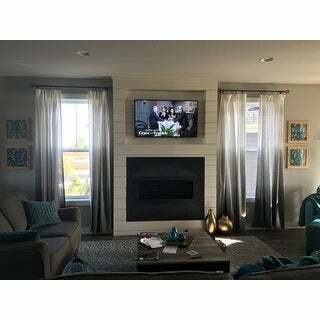 "Love the look of these curtains but.... you do not offer the grey in 84 inch which is what I need. Will you be getting them in?" The 84" L grey Vue Arashi Ombre Panel is now available. "Is this a pair (2 curtains) or just one?" "Do you only get one panel or is it a pear"
it's a pair and they're really nice! I love them because they let light in and are just beautiful! when I purchased these they only came with one panel. I only got one panel in each package. They look great! 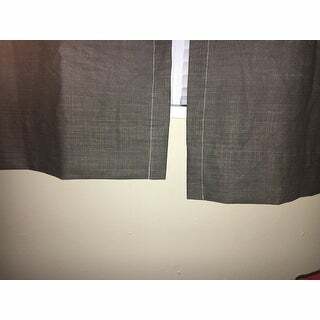 "Are these curtains easily hem-able? I need a custom length in between 84" and 95". I am planning to hem the bottoms. Or even the tops as I will be attaching them with sliding clips." Yes, I would think so. Getting the old hem out would be the hardest part, but you knew that! i see no problem doing that. I like them.